The Strike King Tour Grade Tungsten Slither Rig will get you into the nastiest of cover where jigs won't go. It features a modified Tungsten weight with skirt collar, chip resistant power coat paint and a premium soft-cut silicone skirt designed to punch through matted grass, pads and any type of heavy cover. 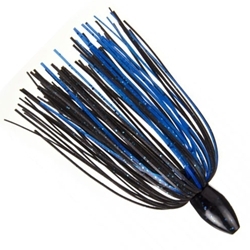 The Slither Rig tungsten weight penetrates and falls thru cover better than ordinary lead weights and the skirt adds that live action needed to turn on big fish. This Strike King Rig gives you the ability to reach fish that you couldn't get before.